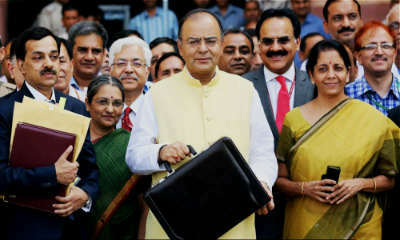 From hoping for profound reforms, grants for agricultural research and infrastructure, cash subsidies, credit augmentation and insurance for farmers, to an enhanced and keen focus on digital, e-commerce sector, reforms like excise roll-backs in the auto sector to extremely defined expectations from the banking budgets, the wish-list for this year's Union Budget 2016-2017 looks unending and very ambitious! The Budget shall be instrumental in effectively channelizing the government's or rather the nation's resources to achieve a two digit economic growth rate under the leadership of PM Shri Narendra Modi – thus, taking a concrete step towards fulfilling the dream of Achche Din. In the Horoscope of independent India, Sun is in the Moon Sign Cancer, and the transiting Sun is passing through the 10th House in the Moon Sign Aquarius and in the Shata-tarka constellation. The transiting Sun is in conjunction with Ketu, which is a negative combination and indicates that the Finance Minister may take some confusing decisions regaring the gold policy, public sector units (PSUs), GDP growth rate, taxation, income tax and sales tax. The 5th House represents the mutual funds, speculators, brokerage houses/ companies, education sector and universities. On the day, 2016-2017 Annual Budget shall be presented, the Lord of the 5th House – Mercury shall be transiting through the Fortune House along with Venus in the Sign of Capricorn and in the Dhanishta constellation. As a result of which, there could be some good news along with fluctuations at times. Venus, the Lord of India's Ascendant Sign, as well as of the 6th House, on the day of Buget will be transiting in the 9th House along with Mercury and the effects of this transit shall be considerably good. Due to this transit, the areas like Travel and Tourism, Transportation, Religious Trusts, Navy, Science and Technology, etc. are likely to benefit. As per independent India's Horoscope, on the day of the Budget being presented, Moon will be passing through the Sign of Libra and the 3rd step of the Visakha constellation, where Jupiter is present already. Due to this, more emphasis will be laid on the medical sector, infrastructure development, bridge-building, civil services, etc. The matter of concern is that, currently, the quadrant positions in India's Chart happen to be marked with combinations of planets which are completely opposite in their ideologies. Jupiter-Rahu, Sun-Ketu, Mars-Saturn – are all negative combinations, and thus this year's budget may be a somewhat complex one. Till now, the Union Budget has been presented 84 times. On the 29th of February, 2016, the Moon will be in the Sign of Libra and in the Visakha constellation. Of the 84 times, in the past, there have been 3 occasions on which the budget was passed on a day with a similar placement of the Moon. Overall, the month of March 2016 shall not be reliable at all. The positive support of Jupiter would NOT be present. Plus, the Monthly support too shall be absent. Thus, the markets shall be playing along only and only on the Yearly Support. Overall, the monthly weightage for the month of March 2016 shall be ZERO, which may make the market quite unpredictable! Here, Ganesha also gives you a list of the zero weightage dates, around which the times and trends are likely to be highly volatile, fluctuating, erratic and unpredictable at Nifty. Some undesirable events, such as earthquakes, tsunami, terrorist attacks, floods, etc. may happen around these dates, which would clearly and directly affect the stock market. May Lord Ganesha bless our nation and people.